Magnet Inspection, Cleaning, Checking for Strength and Contamination Removal advice. Processes, products and levels of contamination vary from industry. Therefore, there is no set timescale for inspecting and cleaning of the magnets. However, magnets operate more effectively when they are clean. It is therefore up to each company, given their expected levels of contamination, to decide when they should be cleaned. A regular rota should be set up for personnel to inspect and clean the magnets. Ideally this will be at least after each different process. This will help in identifying problems up the process line, if some processes show more collection of contamination than others. Rare earth magnets are 10 x more powerful than traditional magnets. They are fitted with keepers for your protection. They must be stored in their packaging and kept at least 12 inches apart. Only unpack one magnet at a time. Once you have removed the packaging, handle only one magnet at a time. We strongly recommend that the magnets are fitted with their keepers on, and then remove the keepers when the magnets are firmly secured into place. When the magnets are removed from the machinery, replace the keepers immediately. Always keep unpackaged magnets at least 3 feet apart. During assembly, fix each magnet into place one at a time. Do not place on steel bench or near other steel objects. Keep away (Min 1m/3ft) from computers, watches, CDs, heart pacemakers and other magnetic sensitive equipment. Ensure suitable PPE is worn when handling magnets. DO NOT subject to excessive vibration. PLEASE ASK OUR ADVICE IF YOU ARE UNSURE. 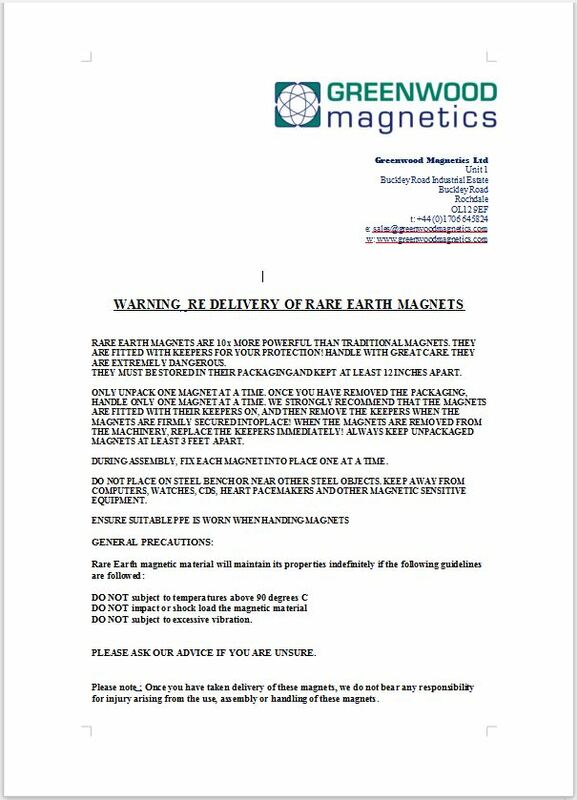 Please note : Once you have taken delivery of these magnets, you are responsible for any injury arising from the use, assembly or handling of these magnets. When we visit for a magnet testing inspection, we do more than pass or fail your magnets. We collect details about each magnet and compile an illustrated report with a photo of the magnet in question, the certified strength, condition and any recommendations. Here’s an example of the magnet test report that you would receive after the inspection. What is the meaning of the term “paramagnetic”? Paramagnetic materials have a small, positive susceptibility to magnetic fields, and are very weakly attracted by an externally applied magnetic field.